The AFM (American Film Market) Conference is underway in Santa Monica and the first bit of news we're hearing (via Screen Daily) is that John Cusack will star in a film adaptation of Stephen King's 2006 thriller Cell. King co-wrote the screenplay with Adam Alleca. The producers are currently seeking a director for the film. "Stephen King is a legendary storyteller and the master at this genre," said Marina Grasic, CEO of Cargo Entertainment, which is co-producing the project. "We believe the reteaming of King with Cusack is a winning combination that audiences around the world will want to see." Cusack previously starred in 1408, a 2007 film based on King's short story of the same title. 419, a suspense thriller by Will Ferguson, has been named the winner of the 2012 Scotiabank Giller Prize for the best Canadian novel published in English. The award itself is not exclusive to crime novels, but since the winner happens to be one, we wanted to mention it here. Lives intersect. Worlds collide. And it all begins with a single email: "Dear Sir, I am the daughter of a Nigerian diplomat, and I need your help …"
When Laura Curtis, a lonely editor in a cold northern city, discovers that her father has died because of one such swindle, she sets out to track down — and corner — her father's killer. It is a dangerous game she's playing, however, and the stakes are higher than she can ever imagine. Woven into Laura's journey is a mysterious woman from the African Sahel with scars etched into her skin and a young man who finds himself caught up in a web of violence and deceit. First published by Viking in March 2012, 419 is not (yet) available here in the US. A film — or mini-series — adaptation of the book Reclaiming History: The Assassination of President John F. Kennedy by Vincent Bugliosi has been in the works for years now. But lately the project seems to have firmed up, with a cast now being assembled for what is expected to be a film release on the 50th anniversary of the Kennedy assassination (i.e. November 2013). Titled Parkland — after the hospital to which the President was first sent, and in which he was later pronounced dead — the ensemble film will explore the impact of the event on a wide range of characters, including an FBI agent, a doctor, a reporter, a Secret Service agent, and others. Three cast members were announced yesterday — Paul Giamatti, Billy Bob Thornton, and Jacki Weaver — though the roles they will play were not provided. Peter Landesman has written the adapted screenplay and will also direct. Reclaiming History was honored with an Edgar Award in 2008 for Best Fact Crime. We're using a script to embed an RSS feed from Amazon.com, which is updated hourly, but if you cannot see the box below — or have scripts blocked — you can click on the image to the right or use this link to see the relevant page on Amazon.com, which includes a list of both the Top 100 Paid and Top 100 Free Kindle Mysteries and Thrillers. 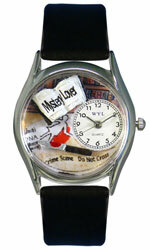 This fun and fanciful timepiece features a colorful mystery lover-themed scene alongside a circular white time display with gold-tone hands and Arabic numerals. Precise, high-quality quartz movement ensures time-keeping reliability, while the black leather band offers a secure, comfortable fit. A stainless steel bezel surrounds the 35-millimeter case and rounds out the details of a watch that every mystery lover is sure to love. This whimsical watch is water resistant to 100 feet (30 meters). As of the date and time of this post, this watch was in stock at Amazon.com and eligible for free super saver shipping and free returns. MystereBooks is pleased to feature All Cry Chaos by Leonard Rosen as today's Amazon Kindle Daily Deal. The deal price of $1.99 is valid only for today, Wednesday, October 31, 2012. Red Rain by R. L. Stine. 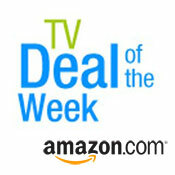 This week's Amazon TV Deal of the Week is Twin Peaks: The Complete Series (Definitive Gold Box Edition). Twin Peaks aired for two seasons on ABC, from April 1990 through June 1991. The primary storyline followed FBI Special Agent Dale Cooper (Kyle MacLachlan), who is sent to the Washington State town of Twin Peaks to investigate the murder of teenager Laura Palmer (Sheryl Lee). Created by David Lynch and Mark Frost, Twin Peaks defies easy categorization. There is, of course, the murder mystery itself but there are also significant elements of suspense, even the supernatural. The melodramatic interpersonal relationships reminiscent of soap operas is also present. The first season of the series was nominated for 14 Emmy Awards, winning two (costume design and single camera editing). The second season was nominated for 4 Emmys. MystereBooks is pleased to feature Special Dispensations by S. I. Wells as today's fifth free mystery ebook (A Legal Thriller; Kindle format only). MystereBooks is pleased to feature Full Bone Moon by G. Cameron Fuller as today's fourth free mystery ebook (A Murder Mystery Inspired by Actual Events; Kindle format only). MystereBooks is pleased to feature The Surest Poison by Chester D. Campbell as today's third free mystery ebook (A Sid Chance Mystery; Kindle format only). MystereBooks is pleased to feature Implicated by Peter Michael Rosenberg as today's second free mystery ebook (A Contemporary Thriller; Kindle format only). MystereBooks is pleased to feature Murder Spins a Tale by Veryl Ann Grace as today's free mystery ebook (A Flock and Fiber Mystery; Kindle format only). MystereBooks is pleased to feature Those Who Hunt the Night by Barbara Hambly as today's Barnes & Noble Nook Daily Find. The deal price of $2.99 is valid only for today, Wednesday, October 31, 2012. 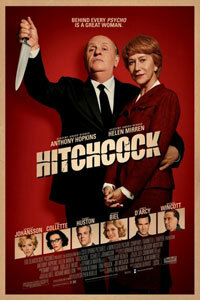 A new poster for Hitchcock has been released by the studio (right; click for larger image). The tagline: "Behind every Psycho is a great woman." 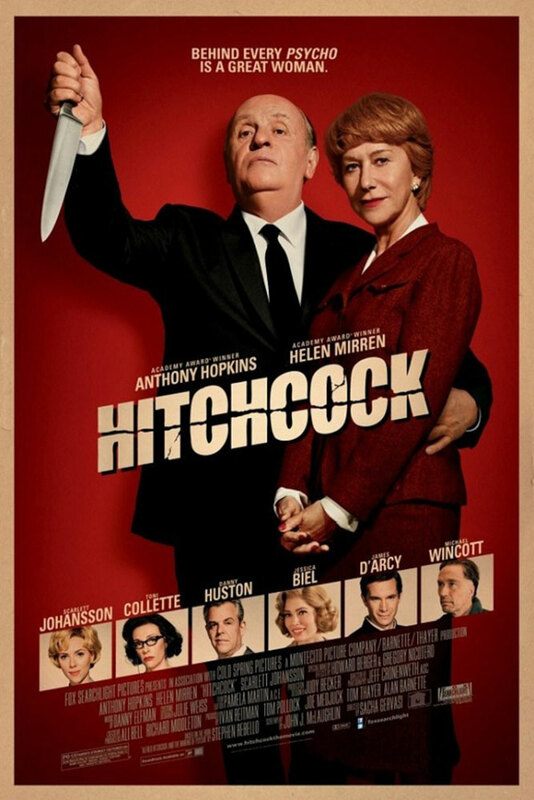 Hitchcock is a love story about one of the most influential filmmakers of the 20th century, Alfred Hitchcock (played by Anthony Hopkins), and his wife and partner Alma Reville (Helen Mirren). The film takes place during the making of Hitchcock's seminal movie, Psycho. A promotional teaser poster for the suspense thriller Stoker has been released by the studio (right; click for larger image). 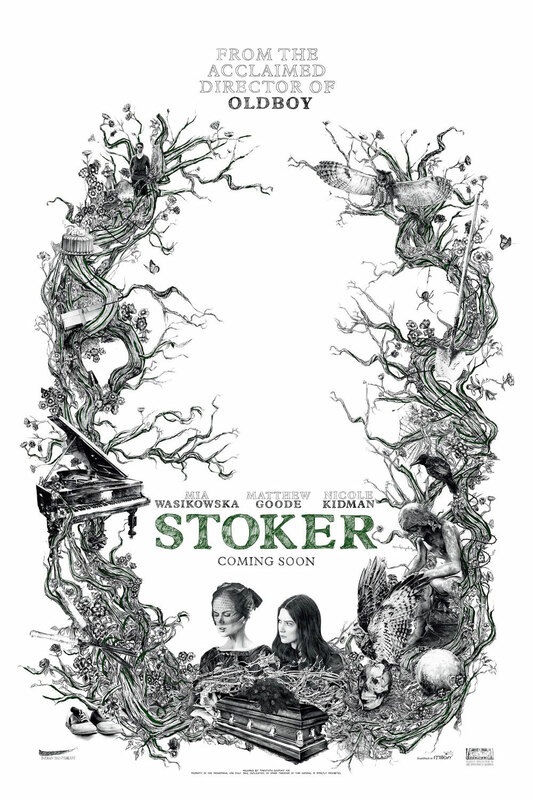 Directed by Park Chan-wook from an original screenplay by Wentworth Miller, Stoker opens in limited release in the US on March 1st, 2013. Last June we reported that Louise Penny's multiple award-winning debut novel Still Life was being adapted into a two-hour made-for-television movie for CBC. Today CBC News has an update on the production, which is underway in Montreal. Nathaniel Parker — who many of you will recognize as Inspector Lynley from the long-running series of mysteries adapted from Elizabeth George's novels — stars as Chief Inspector Armand Gamache with the Sûreté du Quebec. 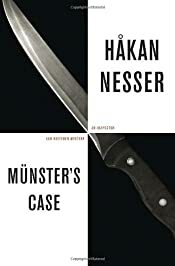 Münster's Case by Håkan Nesser. A Van Veeteren Mystery. Publisher synopsis: For Waldemar Leverkuhn the day could not have begun more auspiciously. He and three of his friends, all retirees, have just won the lottery. It's a modest sum when split four ways—certainly not enough to lift Waldemar out of the plain apartment he shares with his quiet, weary wife — but it's enough for the old men to toast their good luck with a blowout at their favorite bar. The celebration ends, however, with Waldemar drunk, stumbling, belligerent, and eventually dead in his own bed, stabbed twenty-eight times in the chest with a carving knife. MystereBooks is pleased to feature two novels of horror and suspense by Sarah Langan, now available at a special price, courtesy of the publisher, HarperCollins. We generally don't include horror novels on our site, but with tomorrow being Halloween, we thought it might make for an interesting and not entirely inappropriate change of pace. Sarah Langan is a three-time Bram Stoker Award winner, twice for her novels — one of which is included in this promotion — and once for a short story. The ebook format of these titles were listed at $0.99 each from the listed vendors (below) as of the date and time of this post. Prices are subject to change without notice. The price displayed on the vendor website at the time of purchase will be the price paid for the book. Please confirm the price of the book before completing your transaction. 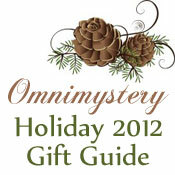 We are delighted to welcome crime novelist Jen Estes to Omnimystery News today, courtesy of Partners in Crime Tours. We encourage you to visit all of the host sites on her current book tour; you can find her schedule here. 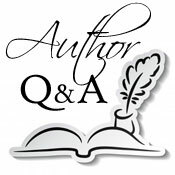 Jen is the author of the "Cat McDaniel" mysteries. The second book in the series is Curveball (Camel Press, October 2012 trade paperback and ebook formats). We recently had a chance to talk to Jen about her new book. MystereBooks is pleased to feature Audrey's Door by Sarah Langan as today's fifth free mystery ebook (A Novel of Suspense; Kindle, Kobo, and iTunes formats). MystereBooks is pleased to feature Cover Her Body by Eleanor Sullivan as today's fourth free mystery ebook (A Singular Village Mystery; Kindle format only). MystereBooks is pleased to feature 82 Desire by Julie Smith as today's third free mystery ebook (A Skip Langdon Mystery; Kindle format only). MystereBooks is pleased to feature China Trade by S. J. Rozan as today's second free mystery ebook (A Lydia Chin and Bill Smith Mystery; Kindle format only). MystereBooks is pleased to feature Mounting Storm by William Thompson Ong as today's free mystery ebook (Kindle format only). Death and the Maiden by Frank Tallis. A Max Liebermann Mystery. Publisher synopsis: Ida Rosenkranz is top diva at the Vienna Opera, but she's gone silent for good after an apparent laudanum overdose. 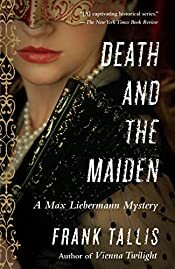 Learning of her professional rivalries and her scandalous affairs with older men, Detective Inspector Oskar Rheinhardt and Dr. Max Liebermann suspect foul play instead. Their investigation leads them into dark and dangerous conflicts with Gustav Mahler, the opera's imperious director, who is himself the target of a poison pen campaign, and Karl Lueger, Vienna's powerful and anti-Semitic mayor. As the peril escalates, Rheinhardt grows further into his role as family man, while Liebermann finds himself at odds with his inamorata, Amelia, who's loosening both her corset and her tongue in the new feminist movement. Earlier this year we reported that A&E had acquired the US development rights to the Danish crime drama Den som dræber (Those Who Kill). Today we're learning that Chloë Sevigny (Big Love, Hit & Miss) has been cast in the lead role of Boston Homicide Detective Catherine Jensen, a forensic profiler with a deep understanding of serial killers. The original Danish drama, which aired only one season, was based on a concept by crime novelist Elsebeth Egholm, who is probably best known for her series of thrillers featuring journalist Benedicte Svendsen, none of which have (yet) been translated into English. 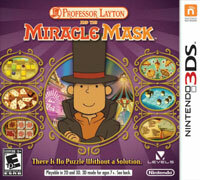 London's most famous puzzle master will need to call on his legendary intellect and dig deep to unravel the mysteries plaguing a city in Professor Layton and the Miracle Mask, the fifth game — and the second in the "prequel" trilogy — in this popular series for the Nintendo DS, which is being released this week in the US. Upon receiving a cryptic letter from a childhood friend, Professor Layton is called to the carnival city of Monte d'Or to investigate a mysterious villain known as the Masked Man. With his assistant Emmy and apprentice Luke in tow, the team arrives in town with a carnival in full swing — only to witness the Masked Man crashing the party! Step into the shoes of a young Layton as the investigation turns to the discovery of a mysterious artifact, and the disappearance of his friend Randall Ascot 18 years ago. Is there some connection between these events and the chaos gripping Monte d'Or today? Brimming with colorful animation and quirky characters, this lively whodunit is a charmingly unique puzzle-adventure sure to entertain players of all ages! Watch a trailer for the game, which is ESRB rated E10+ (mild violence), below. A new poster for the action thriller Hansel & Gretel: Witch Hunters has been released by the studio (right; click for larger image). The tagline: "Classic tale. New twist." 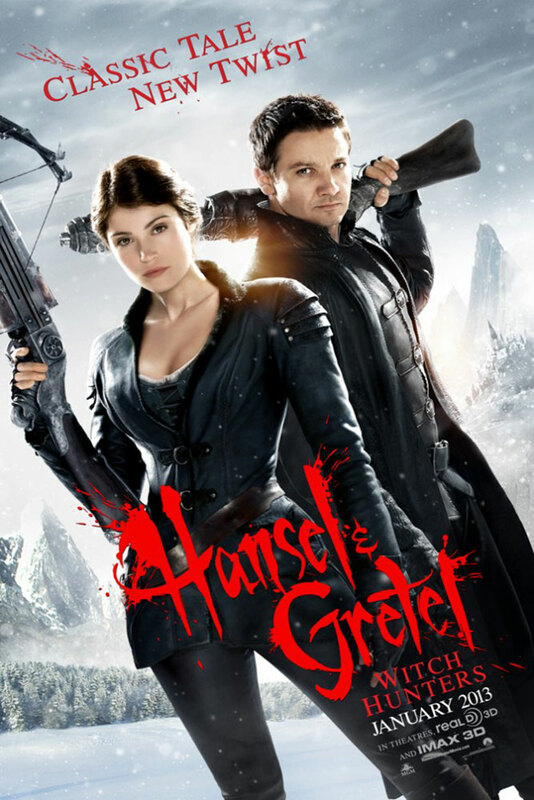 The storyline catches up with Hansel (Jeremy Renner) and Gretel (Gemma Arterton) fifteen years after the traumatic incident involving a gingerbread house. The siblings have evolved into vengeful bounty hunters dedicated to exterminating witches. Over the years, they have became expert hunters, famous for their proficiency at tracking and taking down their prey. Although still recovering from their ordeal, their work is relatively easy as for an unknown reason harmful spells and curses do not work well against them. The Mayor of Augsburg recruits them to rid the town and nearby forests of an evil sorceress (Famke Janssen), who is planning to sacrifice many local children at the witches' gathering during the upcoming "Blood Moon" night in two days time. To make things worse, the duo also has to deal with the brutal Sheriff Berringer (Peter Stormare), who has taken power in Augsburg and conducts a very indiscriminate witch-hunt of his own. Directed by Tommy Wirkola from a screenplay co-written with Dante Harper, Hansel & Gretel: Witch Hunters opens in theaters January 25th, 2013. The studio released a trailer last month, but we don't recall featuring it then, so we've embedded it below. ABC is developing a drama project based on the yet-to-be-released young adult sci-fi thriller MILA 2.0 by Debra Driza. The central character is Mila, a young woman who learns her name also describes what she is: a Mobile Intel Life-like Android, created by the US government. David DiGilio (Traveler) will write the script. 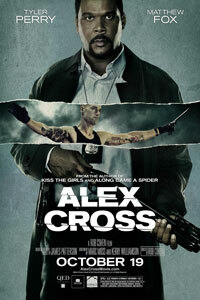 It's a little dated, but here's another US poster for Alex Cross (right; click for larger image). The film, loosely based on Cross, the 12th book in the "Alex Cross" series of thrillers by James Patterson, stars Tyler Perry as the titular character tracking down the man (Matthew Fox), who murdered his wife. MystereBooks is pleased to feature two mysteries in the "Myrtle Clover" cozy series by Elizabeth Spann Craig, now available at a special price, courtesy of the author. Myrtle Clover was introduced in 2009 in Pretty Is as Pretty Dies, published by Midnight Ink. The author has self-published the two books featured in this post, and has just published (this week) the fourth in the series, A Body in the Backyard. Telemystery, your source for one of the most comprehensive listings of crime drama, amateur sleuth, private investigator, mystery and suspense television series, mini-series and made-for-television movies, now available on or coming soon to DVD or Blu-ray disc, is profiling four series on our site being released this week. 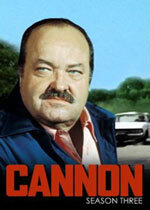 Frank Cannon (William Conrad) is back and keeping the streets of Los Angeles safe in the action-packed third season of Cannon, taking on everyone from a kidnapper to an incarcerated burglar to a psychopathic killer. All 24 episodes of this third season, which originally aired on CBS during the 1973/1974 television season, are available via manufacturing-on-demand from Amazon. The original release date we had for this set — October 30th — may have been delayed. Amazon no longer shows a date, while other sources indicate a November 6th date. It may be, however, pre-ordered. This BBC America original historical crime drama, which aired its first season earlier this summer, centers on Kevin Corcoran (Tom Weston-Jones), an intense, rugged Irish-American cop working the city's notorious Five Points neighborhood. Corcoran is struggling to maintain his moral compass in a turbulent world, while on an emotional and relentless quest to learn the truth about the disappearance of his wife and the death of his daughter. His friendship with two Civil War compatriots — the wayward son of a wealthy white industrialist and a black physician, who secretly assists Corcoran with his detective work — takes him to the contrasting worlds of elegant Fifth Avenue and an emerging black community in rural northern Manhattan. The three men share a secret from their experience on the battlefield that inextricably links their lives forever. 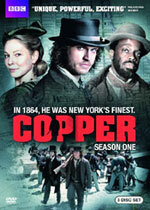 Copper has been renewed for a second season. Terence Hill stars as Don Matteo, a thoroughly ordinary Catholic priest with an extraordinary ability to read people and solve crimes. He is a parish priest who never met an unjustly accused person he didn't want to help. In fact, he never met anyone marginalized he didn't want to help: the elderly, the homeless, the immigrant, the unemployed. He sees them all as he bicycles along the streets and through the countryside of his parish. His friend and chess partner is policeman Marshal Cecchini, who slips him information about new cases much to the chagrin of the police chief who isn't at all thrilled about the collaboration. 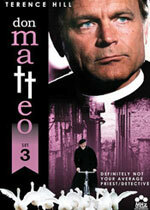 But he's in agreement with Don Matteo about one thing: the importance of justice being served. The episodes included in this set, in Italian with English subtitles, originally aired during October 2001. Also being released this week: Don Matteo, Set 4: Episodes 25-32, which originally aired during November and early December 2001. Karl Malden stars as San Francisco Detective Lieutenant Mike Stone in this crime drama set in the city by the bay. The first four seasons featured Michael Douglas as Stone's young partner Steve Keller, who left in a dispute with producers at the end of the fourth season. In this fifth and final season, Richard Hatch joins the cast as Dan Robbins. 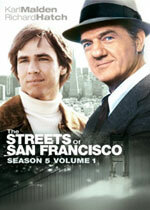 Also being released this week: The Streets of San Francisco: Season Five (Volume 2). This Italian crime drama is a prequel to the popular Detective Montalbano series, and stars Michele Riondino as the titular character, which is based on one created by crime novelist Andrea Camilleri. This DVD set includes the first three (of six) episodes of the first season, in Italian with English subtitles, which aired earlier this year. A second season has been commissioned. 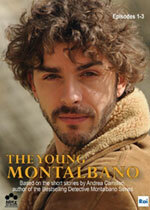 Also being released this week: Young Montalbano: Episodes 4-6.